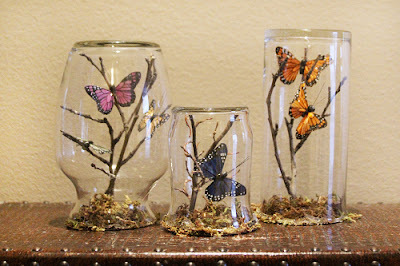 Butterfly arts and crafts are ideal for the spring and summer seasons. I have a real liking for winged animals and creatures real or fictional: birds, butterflies, bees, dragonflies, dragons, Pegasus the flying horse, fairies and angels. Wings officially rock. Here to inspire you are 10 best butterfly crafts for adults based on this divine and colorful little insect. Enough to keep you busy with your crafting for some time. Enjoy making these cute butterfly crafts for your DIY projects. Do let me know which ones you like the look of best in the comments section. Now let's get started. 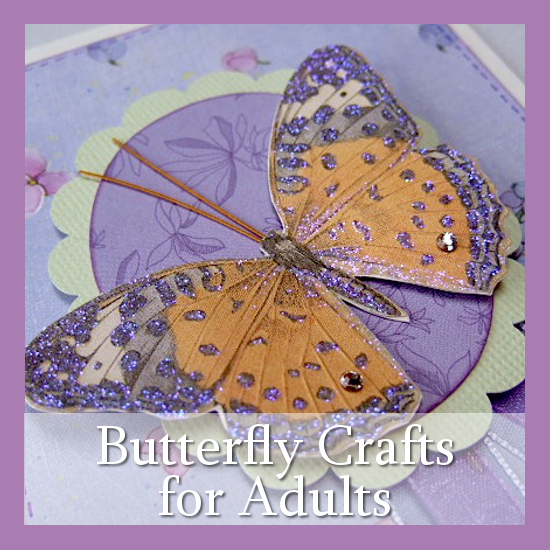 Butterflies make wonderful Spring and Summer themed crafts that adults can enjoy. Here's a selection of my favorites shared with you. If you really enjoy your papercrafts and working with fine glitter powders, you should really love this tutorial. This shows you how to create some gorgeous 3D, layered paper embellishments. These can be made in pretty much any size that you like to work with a specific project whether it's for home decor, handmade cards, scrapbook layouts, mobiles, wedding stationery or something else entirely. The ones pictured here are about the size of an adult palm, so a reasonably large embellishment. I do enjoy using glitter glue very often but this goes one step further and makes use of those extra fine glitter powders which really add some amazing sparkle and shine when viewed from any angle. These ones use vintage style scrapbook papers with a top layer of translucent vellum but these would look equally as nice made from newsprint, magazine paper, old and unwanted books or maps. Create your very own slice of Spring or Summer inside your home with these beautiful and delicate scenes from Crafts Unleashed. Recycle your unwanted glass jars, mason jars, glass vases or even wine glasses to make a scene that will delight you for months to come. I can just imagine enjoying one of these through the cold months while waiting for warmer days to arrive. You can buy butterfly embellishments or make your own like the 3D paper ones above to pop into your scene. 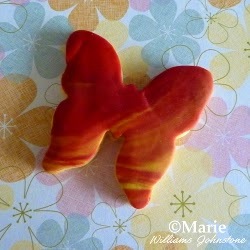 If you ever loved playing with Play Doh or you really enjoy clay crafts like polymer clay, you should love making some super spring butterfly cookies which have a marbled effect fondant icing. Ready to roll fondant icing is great fun to work with and actually quite easy as a way of decorating cookies and cakes. It's just like using a Play Doh but for grown ups. I'm no expert baker but I love to make things that look pretty as well as being tasty too. This tutorial shows you how to work with the icing to create a pretty marbled effect which can be subtle or loud depending on your color scheme. When I make cookies, this is very often how I cover them and it always goes down a storm at school events and parties. I started crochet a few years back and am am really loving it. I'm always on the lookout for sweet and simple crochet designs. These little beauties from Little Birdie Secrets make gorgeous embellishments for handmade cards, hair and fashion accessories and home decor. The patterns are available in 5 sizes from teeny tiny to extra large and suitable for anyone who can work basic crochet stitches. I'll be practicing these real soon. You can also have a go at my own mini crochet flutterby designs with buttons. 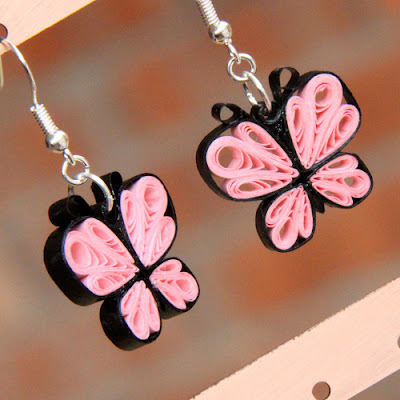 Quilling is a beautiful and traditional craft that is really coming back into vogue - and you can see why with these stunning earring designs by Honeys Quilling. This is a fab tutorial which shows you step by step how to make these little darlings and then shows examples of them used as earrings or really sweet hair clips. Basic quilling sets normally give you enough to get you started. You'll need the strips of quilling paper, the slotted tool and glue as the minimum items to begin. Perfect for people who like taking time over making papercrafts. 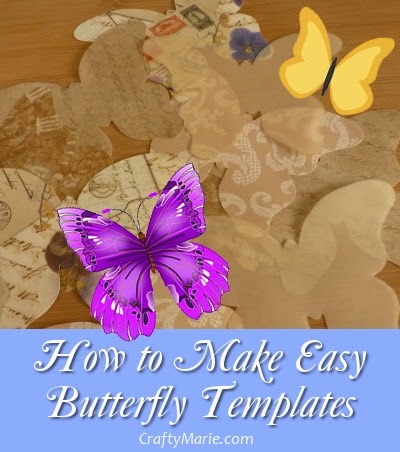 Whatever crafts you do whether paper or fabric or something else, there may well be times that you really need a template or pattern of a butterfly shape. Yes you can go online and find one but will it be the shape and size that you really want or need for your own project? This page shows you different ways, approaches and techniques for creating your own templates and patterns from scratch. They're the same techniques that I use when I need a stencil or template to work with whether it is for garlands, banners, applique, papercrafts, felt embellishments, embroidery motifs or something else. Despite owning electronic and manual craft cutters such as the Sizzix Big Shot, I still very much prefer the traditional methods of making my patterns out of thick card and they keep for years and years if stored carefully. See how you can make your own ones too. Who would have thought of making these beautiful, winged creatures from milk jugs! This wonderful guest post on Alpha Mom takes you through turning milk jug plastic into something very special. She uses colored Permanent Marker Pens, pipe cleaners (chenille stems) and beads along with recycling milk jugs to make these gorgeous designs. This is a great idea for up-cycling those empty bottles into something that looks good for your home. Here they have been turned into a mobile but you can use these as embellishments for many craft projects. Super easy and cheap is this idea of framing your embellishments over a deep recessed backdrop of patterned paper or fabric. A quick way of making some pretty home decor with some really inexpensive frames which I bought from the dollar store. I made these ones to match along with the playroom scheme which is in the same colors and theme. You could try some muted colors using black rimmed photo frames and butterflies made with paper from old and unwanted books, magazines or newsprint for simple and stylish decorations. Ideal for birthday parties as well as Spring and Summer events are these delicious cupcakes topped with completely edible butterflies. These make a wonderful and special looking treat for parties, weddings and occasions like Mother's Day where you need to bake something that actually is not impossibly hard but has a bit of a wow factor. While these take a little time, you can made the edible toppers the day before and store them before baking the cupcakes fresh on the day. If you really want to save time, you can use store bought cupcakes and focus merely on the decoration. Clay crafts are a skill that I will sadly never possess which is a real pity when you see how gorgeous these little butterflies are. Over at Creators Joy, you will see a photo which gives you a very good idea of how the clay canes are constructed in order to make these fabulously pretty wings. Once the Polymer cane is made, you can cut off multiple wings and then press together with a roll of black clay for the body in the middle. I love the look of these and they would be ideal embellishments for my picture frame craft above too. If you're tempted to try this craft, I'd recommend starting out with a sampler set for Polymer Clay which contains enough different colors of clay in small amounts to begin with. I would resist the temptation to buy tools until you know whether this is something you will really get into. 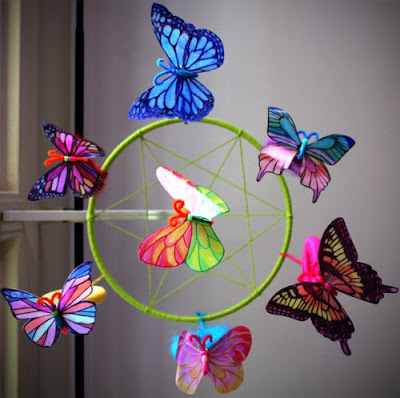 You don't really need tools to make items like these butterflies - just a lot of rolling! That's my round-up of crafts based on this gorgeous insect. I hope you've enjoyed reading my craftymarie article today, thanks for your visit. Do fly by again soon. 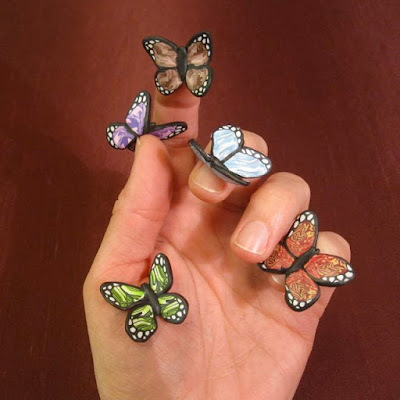 Thanks for including my paper quilling butterflies in this post! All images on this site are my own and belong to Marie Williams Johnstone or are product and public domain photos that are used with permission. I'm Marie, a freelance writer from the UK. I'm an adult craft-a-holic who loves making cute things. I love gardening, nature and wildlife. Disclosure: This site may generate income via affiliate advertising programs. See the FTC Disclosure if you need more info.